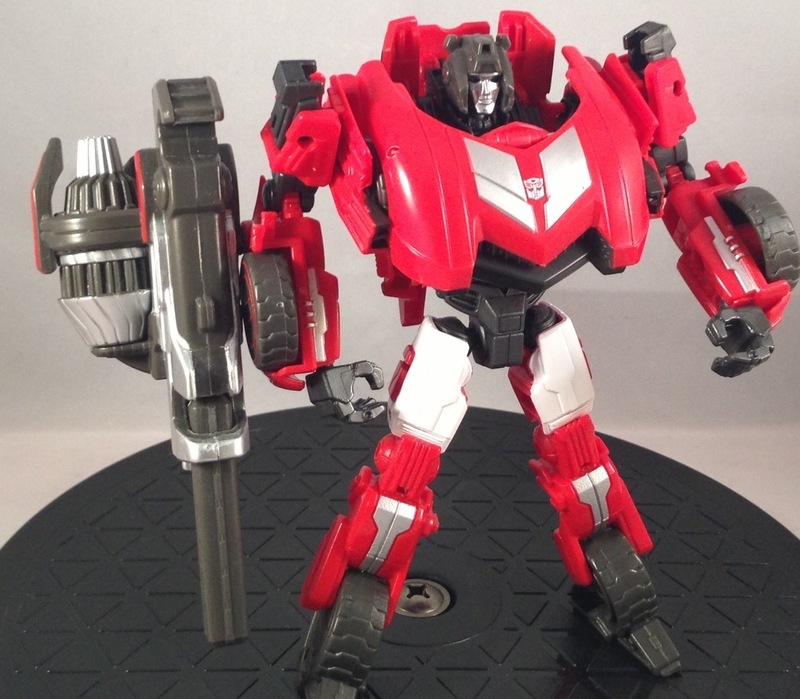 As with the some of the others, Sideswipe is a retooling and repaint of another mold, in this case Jazz. 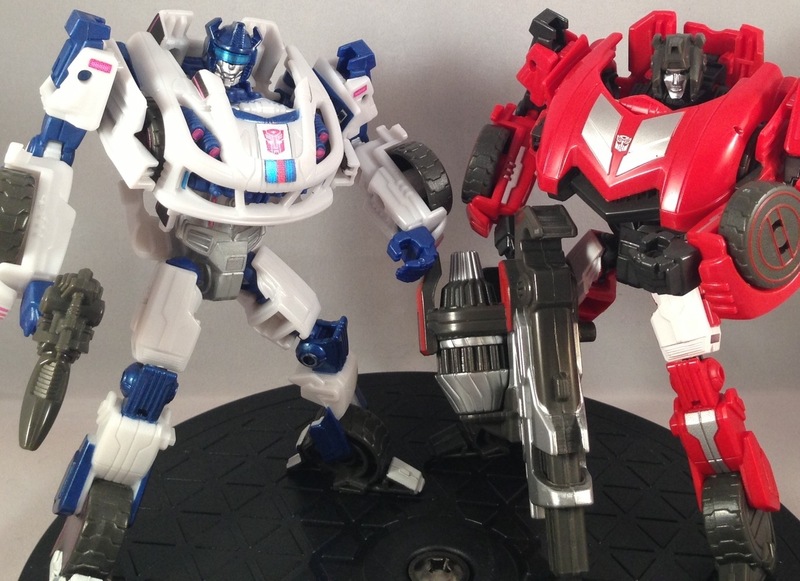 Now, take this line for what you will, I really love them and while I think Jazz is great, Sideswipe seems to make far better use of the mold. I really think they did an amazing job of making him exceptionally Game-accurate. 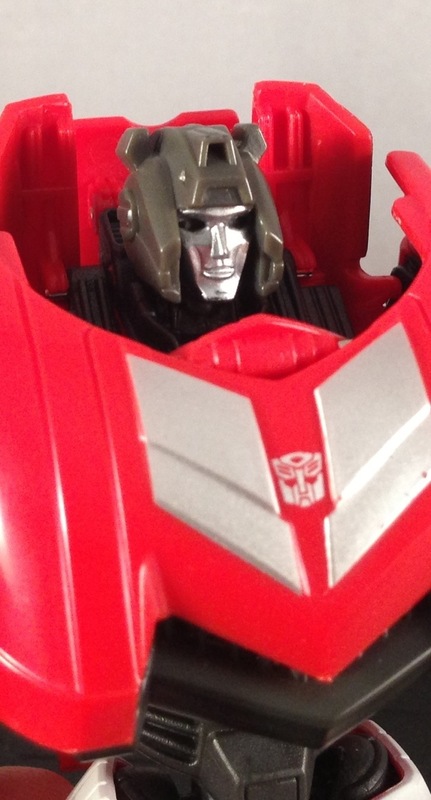 The front end/ chest is entirely replaced, and the head sculpt is spot on, though..I don’t get why they left the eyes grey. He has no light piping that I know of. I’m hoping reprolables makes a set that includes blue eyes for him. His weapon is designed after my personal favorite gun for the game, the path blaster. Though in this case, it’s huge, and has a turbine engine attached to the side. It’s actually a bit heavy for his arms, so I keep it pegged into the side for more balance and support. Here’s a comparison shot with Jazz. Jazz is touched up with reprolables at this point. After spending so much time with Masterpiece Sideswipe, I find myself loving the silver pin stripes on FOC ‘Swipe. It’s a nice touch from the Game and I’m glad they added such details. 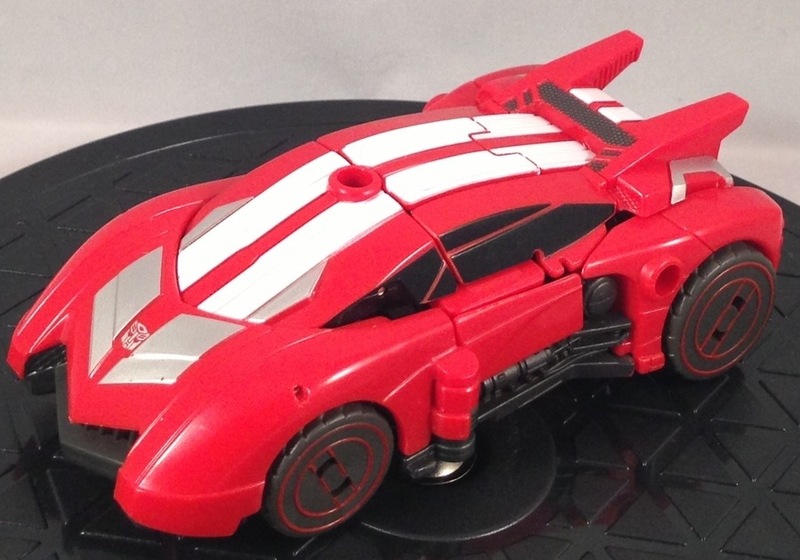 In alt-mode though, Sideswipe REALLY takes the cake. He looks just awesome and aside from the rear “hands” issue, I can’t find anything wrong with him, though as usual, a few detailing stickers will be nice. 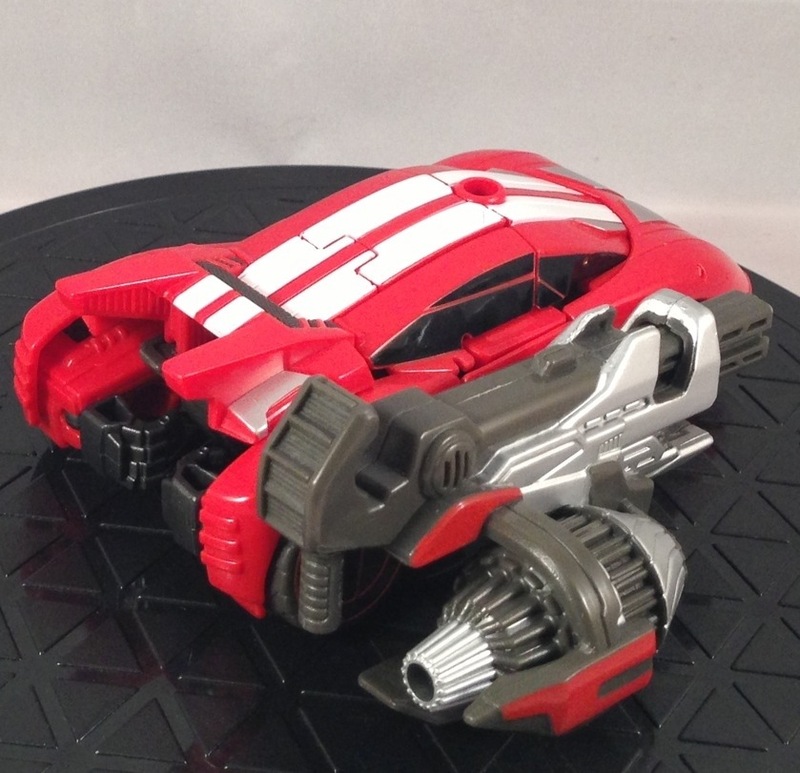 His UBERblaster attached to the side as well, though…I prefer to just leave it off. 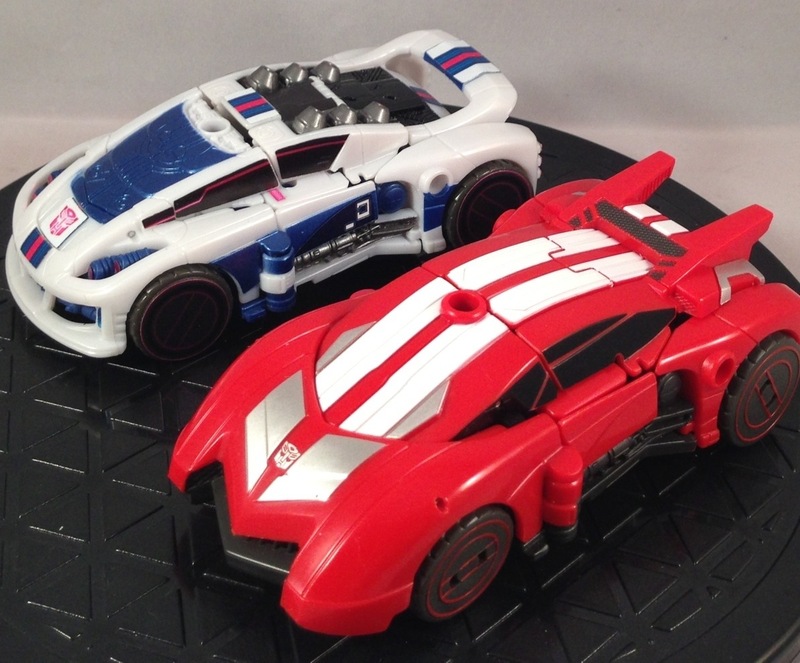 I mean, again, the excellent retooling job keeps them looking completely distinguishable and I really like both cars, they are my favorite of all the designs so far! I’m very happy to have him on my shelf. I haven’t seen too much of a difference between Hasbro’s and Takara’s though I’m sure the differences will be subtle. 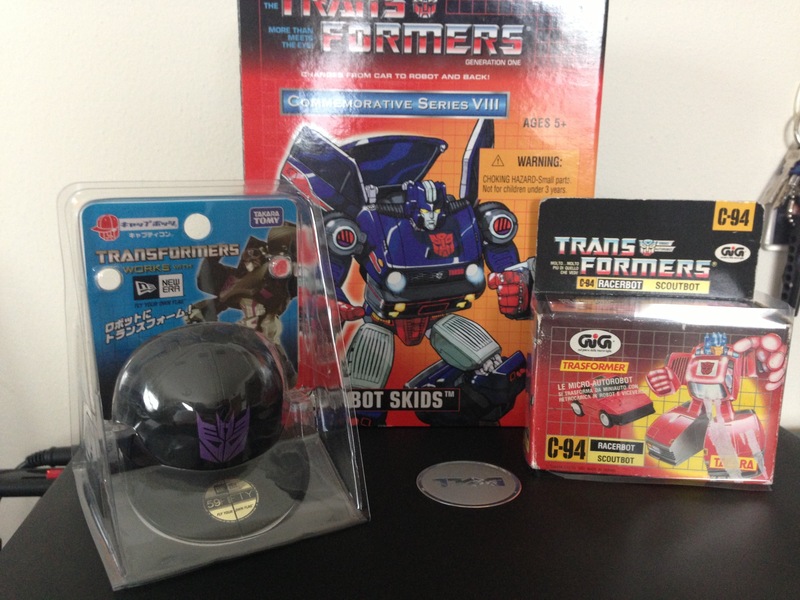 I’ve got a couple of Takara boxed Throttlebots…love those small boxes. It’s one of my favorite parts! Nice haul! I’d say you have the itch, but there’s nothing wrong with that! Let me know how you like that cap-bot! He’s really cool Ark! He’ll be my next post ! That may be somthing to pick up! He is pretty awesome! Thanks, I’m more happy with Chase than Skids…for obvious reasons. As usual, nice review. I’ll be waiting for your FOC Grimlock review, as I’m on the fence about purchasing him. That Throttlebot packaging is beautiful! Makes me want to start hunting them down! Me too J, I hope he’s as good as Soundwave! Yeah, Italian GiG with Takara Packaging ! 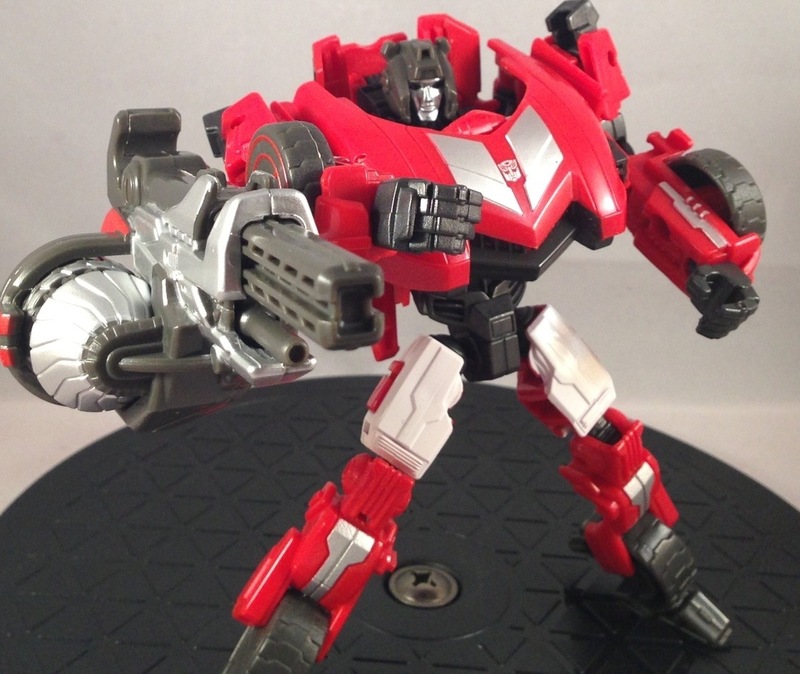 Just curious, but do you have any thoughts a the3rd party Quake wave figure? Hmm…Quake Wave? Is that the new Shockwave MP-like figure? I think he looks great, but I’ll have to wait until final colors and price before I make a move. He’s awesome, but I’m not forking over 200+ for him. Yes that’s the one. He is a fav of mine but can’t justify the price. Lol G1 is prob cheaper loose. That’s an amazing price. I’m not sure why you wouldn’t be “keen”, you’re missing out on some amazing figures. Hey! Awesome review. I actually used this in the video of your site which went up today! Hey, that’s great! I can’t wait to see the video!